Humans are knowing creatures. Our mental capabilities are vital to our existence and full of amazing possibilities. Our ability to expand our knowledge spurs science, culture, and religion forward. But how do we know what we know? Maybe we should back up a little. What is knowledge? How do we grow what we know? Can we justify what we know to others? Knowledge—what seems to be a basic feature of everyday life—is a complex subject. In short, epistemology is the study of knowledge. Philosophers know it as the “study of the theory of knowledge.” We’ll look at a brief historical overview of the philosophical category of epistemology. Our special focus will be the differences between rationalism and empiricism. Belief – You must believe something in order for to have knowledge. You cannot know something is you don’t believe it. Truth – The thing you believe must correspond to reality. You cannot know something that is false. Justification – You need a reason for your belief. This is why guessing the number of M&Ms in a carnival game (it’s 527 by the way) by chance is called “luck.” You cannot “luck” into knowledge. Belief + Truth = Something you believe, that’s also true, but for which you lack any justification. Some might call this blind faith. 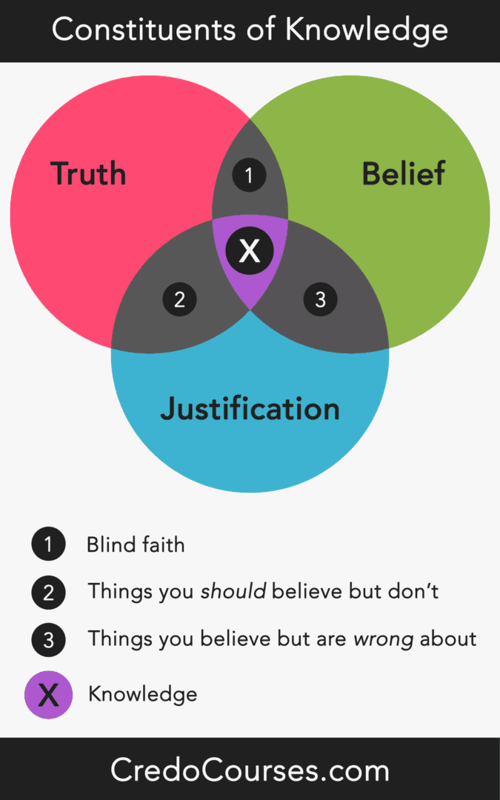 Belief + Justification = Something you believe but are wrong about. Truth + Justification = Something you should believe but don’t. The knowledge of a person through being in some sort of relationship to them. Sometime called intimate knowledge. The knowledge of a skill or ability. For example, knowing how to play an instrument or a sport. It’s a knowledge gained through repetition and the development of muscle memory. The knowledge of facts or propositions gained through study or observation. What’s it like to have one kind of knowledge but not another about a topic? Imagine I knew every fact (proposition) about you mother: height, favorite movie, age, etc. My knowledge would still be qualitatively different from yours. You know her (acquaintance knowledge). I just know about her. The same goes for competence knowledge. You can tell me all the facts about how to play the trumpet, but I won’t be able to play it well without practice and repetition. The other minor schools of thought are just variations of these two. I consider myself a rationalist and utterly detest empiricism. Nonetheless I’ll try to give you an accurate account of both. The world of the forms is an unchanging immaterial world of pure being. The world of particular things is the material, constantly changing world we’re all familiar with. Plato got these ideas from two philosophers before him, Heraclitus and Parmenides. For Heraclitus, ultimate reality is in a state of flux; it’s always changing or becoming. He said that you can never step in the same river twice. If you remove your foot from the river and then put it back, all the molecules have moved and it is, in a sense, a different river. Parmenides, on the other hand, believed that all of reality is pure being. He realized that there are such things as universal, unchanging principles. For example, one plus one equals two. Plato taught that every particular thing represents an essence. For example, if you draw a square your drawing would be a particular square and not the essential or perfect square. Your particular square is representing the idea (form) of the perfect square. Plato applied this dualism to mankind saying that the human being is composed of body and soul. The body is participating in the world of becoming by getting older and changing in appearance. The soul is participating in the world of the forms through immortality and reason. Plato did this because he noticed that humans are capable of interacting with the forms through reason. He attributed this ability to the reality of innate ideas. Innate ideas are a form of knowledge that the mind contains prior to experience and birth. For Plato, innate knowledge is knowledge of the forms. Plato explained the existence of innate ideas with that of the preexistence of the soul. The only way that one could have knowledge of the forms at birth is if the person’s soul existed in the world of the forms prior to birth. For Plato knowledge in this life is not a process of acquisition but of remembrance. Plato contends that the world of particular things is structured off off the world of the forms. This means that the mind is capable of understanding things about the external world (the world outside one’s own mind) because it’s conscious of the structure that the world it’s founded upon. This is essentially what it means to be rationalist; it is to believe that the world and the mind share the same structure. This is what makes knowledge possible. For the rationalist, reason is both a reliable and primary guide for grounding knowledge. Aristotle was Plato’s student. He knew all about Plato’s doctrine of the two worlds, but rejected it. Although he believed in universals (forms), he denied the preexistence of the soul as being necessary to explain how we know about them. Aristotle said we become conscious of universals the other way around. Rather than starting with innate ideas we start with particulars and work our way up. This is because Aristotle believed that universals or the forms are not innate knowledge. Aristotle said we’re all born as blank slates. We acquire knowledge through our experience of particulars. We then universalize these experiences and apply them to new experiences. If you answered “Bat” congratulations! Bats are mammals the rest are birds. Bird-ness is what all the members of the list above share (their similarity) except for the bat. We learn what bird-ness is by experiencing particular birds. This is what it means to be an empiricist; we gain knowledge through experience. For an empiricist, experience is the grounding principle of knowledge. In conclusion, as tempting as empiricism may appear, it has significant problems. How can the idea of similarity even get off the ground if we didn’t have some notion of it to begin with? This goes for the idea of equality, dissimilarity, and sameness as well. If it’s true that we’re born with no innate knowledge how could we come to any conclusions at all? We couldn’t. Empiricism destroys knowledge. We’d be a bundle of perceived particulars we couldn’t do anything with. We’d be like the beasts driven by instinct. Or we might be like a tree having life but no discernible consciousness. If empiricism destroys our foundation for knowledge then it is demonstrably inferior to rationalism. Furthermore, rationalism works. We can apply universal principles to the external world (the world outside our own minds) successfully. Engineers do this every day. They draw their reason on paper. When followed, reason produces stable buildings. This implies that reality has a structure complementary to the human mind. But how could this be? Was Plato right? Is there a world of forms that serves as the foundation for the world of particular things? Since we just finished beating up empiricism you may be tempted to say “yes.”. Not so fast. There’s one more qualification we need to make. In the Christian worldview God is the only entity which has the characteristic of aseity. Aseity is complete independence. The forms are not completely independent, but rather find their origin in the mind of God which St. Augustine pointed out. Because we’re created in God’s image we have these principles implanted in our consciousness. This makes the whole knowing enterprise possible. It also explains why rationalism works. The external world is intelligible because a supremely intelligent God created it. It has the most explanatory power. It does not share the weaknesses of empiricism. It’s faithful to the Bible. It works in the real world. So there you have it, an overview of the differences between rationalism and empiricism.